The 2000 year old Divya Desam praised by ThiruMangai Azhvaar and BhoothathAzhvaar is on the outskirts of Chennai, about 5 kms West of Pallavaram. At Thiru Neermalai, one finds Lord Vishnu in four forms - Sitting, Sleeping and Walking posture atop the hill and Standing posture in the temple at the foot of the hill. Tiruneermalai Neervanna Perumal temple is one among the 108 Divya Desas of Perumal. Lord appears in four postures. 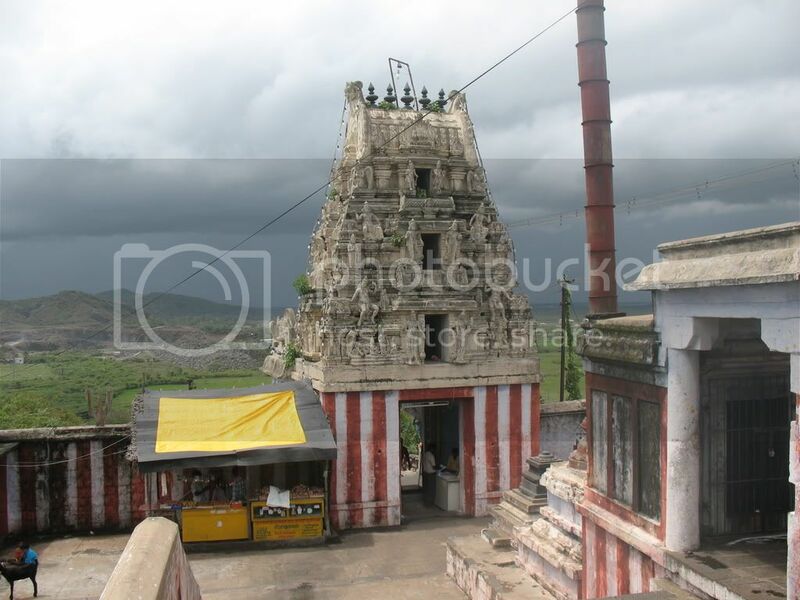 Narasimha blesses here as Lord Bala Narasimha. This is a hill temple. There are two big temples both at the top and the foot hill. Lord appears in four forms representing three incarnations of Lord Vishnu. 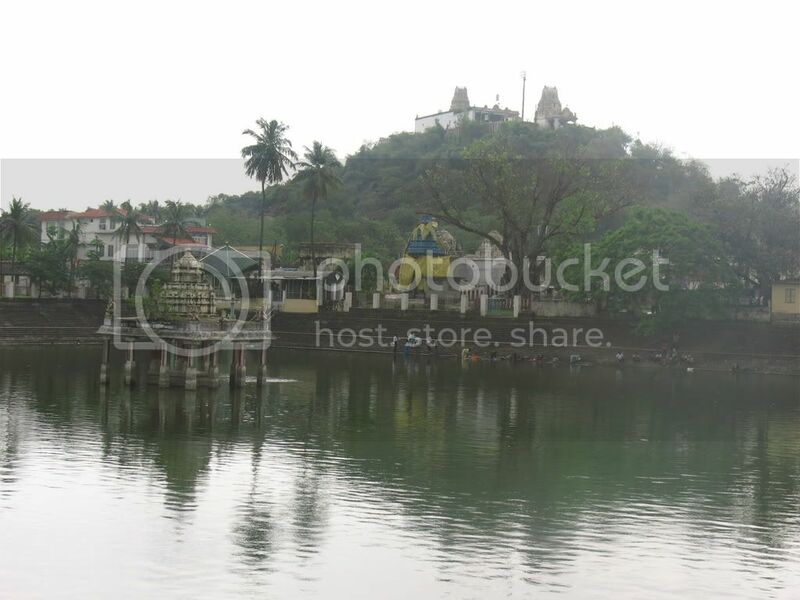 The temple has a beautiful Teppakulam-tank covering three acres with a Mandap at the centre. This is praised as Suddha Pushkarini, Ksheera Pushkarini, Karunya Pushkarini and Swarna Pushkarini. Two time puja is performed in the temple according to Vaikanasa Agama rules. Lord Sri Rama is in separate shrine. Sage Valmiki, author of the celebrated epic Ramayana, desired to have the wedding darshan of Lord Sri Rama. He came to this place and performed penance to achieve his aim. Lord Rama appeared before the sage as he wished with Mother Sita and brothers Sri Lakshmana, Sri Bharatha and Sri Satrugna. The sage wished the Lord to stay in the place for the benefit of all devotees and Lord was happy to oblige him. The sage is in a separate temple at the foot of the hill. As He is in a place surrounded by water (Neer in Tamil), He is praised as Neer Vanna Perumal and the place Tiru Neer Malai – meaning mount surrounded by water. Sage Valmiki as a swayambu appears in a worshipping form in the shrine. Saint Tirumangai Azhwar came to this place for Perumal’s darshan. He could not see Perumal as the mount was surrounded by water. Azhwar decided to wait and have the darshan of Lord and stayed in the opposite hill. Though days moved, water level did not recede. He was steadfast in his determination and waited till the water level lowered, had the darshan. Pleased with His devotee, Perumal granted four darshans to Azhawar – Neer Vanna Perumal standing, Narasimha sitting, Ranganatha reclining and Ulagalanda Perumal in walking postures. The devotee can enjoy these darshans in the temple. Lord Neervanna Perumal is at the foot of the hills while Ranganatha, Narasimha and Ulgalanda Peruamal are at the hill temple. Though Lord Narasimha is known for his furious appearance, He is smiling and cool here. After killing Hiranya to save his devout son Prahlada from his tortures, He was still furious. Boy Prahlada was very much afraid of Lord’s fury. To make His devotee happy, Lord Narasimha shed His fury and appeared before Prahlada as a smiling boy Himself. He thus became Bala Narasimha. There is a shrine for him in the hill temple. Behind Bala Narasimha is Ugra (furious) Narasimha with two hands. We can worship Narasimha in two forms Bala and Ugra. Raja Gopuram, Bali peeta and Kodimaram the flag post are generally in a row in temples. Here, the Bali peeta and flag post are slightly away from the Rajagopuram. As Perumal granted darshan to Sage Valmiki as Neer Vanna Perumal and Sri Rama, they are considered prominent in the temple. Therefore, to emphasize their importance, Rajagopuram is before Sri Rama shrine and the flag post before Neervanna Perumal. Sage Tirumangai Azhwar had praised Mother in his Mangala Sasanam hymn as Anima Malar Mangai. The procession deity in Vishnu temples are generally placed before the presiding deity. Presiding deity is at the hill temple and the procession deity Azhagia Manavalar is at the temple in foot hills. Azhagia Manavalar shall be coming to the hill temple on the flag hoisting and lowering days during the Chithirai (April-May) Brahmmotsavam and the Panguni Uthiram (March-April) wedding festival day, three days in total when devotees will have the joint darshan of the presiding and procession deities together. Brahmmotsavam is celebrated to Lord Ranganatha in the hill temple in Chithirai (April-May) and in Panguni (March-April) to Lord Neer Vanna Perumal at the foot hills. On the Vaikunda Ekadasi day in December-January, Azhagia Manavala Perumal passes through the Sorga Vasal. He also grants the Garuda Seva darshan on Masi Magam day in February-March. A one day festival is celebrated for Narasimmha in Aani (June-July) and for Ulagalanda Perumal in Aadi (July-August). Wedding festival for Neervanna Perumal and Anima Malar Mangai is celebrated on the Uthiram star day in Chithirai-April-May. We have seen Gods coming in procession on one vahan only during festival days. But Ranganatha comes in seven vahans in procession in a single day on the Rathasapthami day in Thai month (January-February). During the sunrise, Lord Ranganatha comes in Surya Prabha vahan when Arti is shown from foot to face as if Sun God himself performs this puja. Then He comes in procession on Hanumantha, Garuda, Sesha, Horse, Lion and Surya Prabha vahans. The holy tank is one in form but comprises of four theerthams. In Kumbakonam, the Mahamaga tank is believed to be a confluence of 19 theerthams. Similarly, four theerthams Siddha, Swarna, Karunya and Ksheera theertham confluence in this holy tank. Eight Vishnu temples in India are considered very important praised as Swayam Vyaktha Kshetras of which this Tiruneermalai temple is one. Others are Srirangam in Tiruchi district, Srimushnam in Cuddalore district, Tirupathi in south and Salagramam, Naimisaranyam, Pushkaram and Naraanapuram in north. As this is a hill temple, Giri Valam is observed on Poornima-new moon days. The hill is also known as Thoyatri Malai. Thoya means milk. Lord is under the Thoyatri Vimana. Special pujas are dedicated to Lord Ranganatha on Saturday with Pushpangi Alankar with flowers. After the darshan of Lord in Srirangam in reclining posture, sages Markandeya and Brugu were returning to their places. The darsahn at Srirangam was afresh in their minds. They prayed to Lord to grant them darshan again at this place. Lord granted the darshan as Boga Ranganatha in reclining posture in this place and continues to bless from the hill top His devotees. Abishek is not offered to Him except a Thaila Kappu – applying cosmetic oil on the idol- once in a year in Karthikai month-November-December. Devotees bathe in the tank for health and cure from illness and for a clear mind and worship Perumal. Devotees also seek child boon by placing cradles in a tree and for removal of obstacles in marriage efforts. This is a prarthana sthalam and the Lord is said to answer prayers relating to different issues, especially marriage. 08:00 am to 12:00 noon ; 04:00 pm to 08:00 pm. Thiruneermalai is 5 kms from Chennai Pallavaram. Buses are available from Tambaram bus stand. Also one can reach Thiruneermalai by electric train from Egmore to Pallavaram and continue by bus. Nearest Railway station is Pallavaram and airport Chennai Meenambakkam.